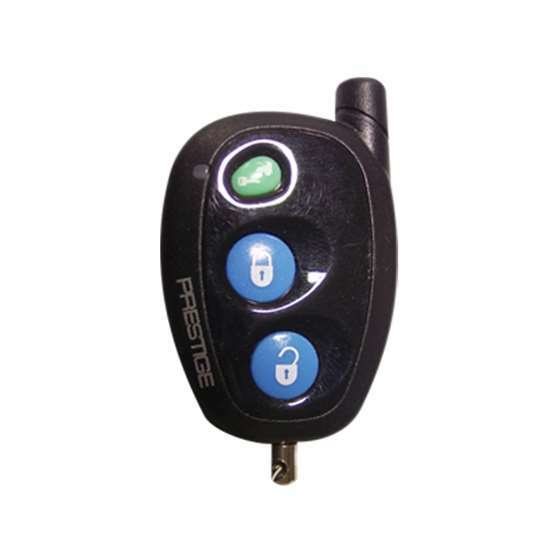 ATTENTION: These transmitters makes use of icons (symbols) to identify the reaction your security system/keyless entry/and or remote start system, where applicable, will have when any icon (button) is pressed.These icons are programmed at time of installation to meet the needs of the individual and to complement the vehicle that the system is installed in. To replace a transmitter or add transmitters, please follow the programming instructions listed on the pages of this manual. Although the most common use of the transmitter buttons are shown on the front page of this guide, any button or button combination can be programmed into any receiver channel. Additionally, if all 4 buttons are used and you require access to a 5th channel, you would program a combination of buttons to control the 5th function. i.e... you have programmed lock for arm, unlock for disarm, trunk for trunk release, and OPT1 for garage door operation, and you've added a window up module that you want independent control of, you would program unlock and trunk buttons pressed simultaneously into the receiver to control this function independently. 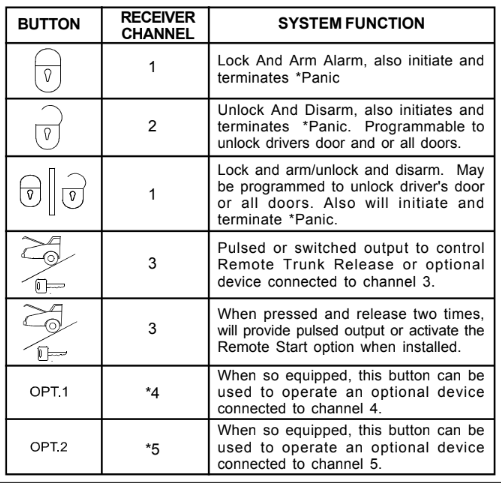 Also, if you do not program a transmitter button into channel 2 which is the separate unlock/disarm channel, then whatever button is programmed into channel 1 will serve as both lock/arm & unlock/disarm. 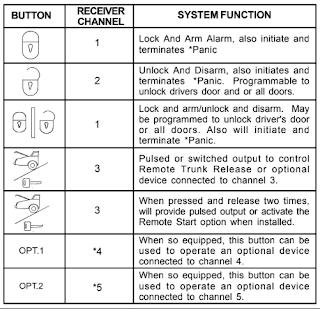 Note: Some systems are capable of single button programming, if your alarm module is capable of this feature, simply complete step 4 of these programming instructions for each transmitter you wish to control your system and exit the program mode by switching off the ignition key. NOTE: Channels 6 and 7 can be used as a separate output to control a function other than driver priority. Simply programming any unused transmitter button other than the unlock button will allow complete independent control of these outputs.